By 1518, the peace that had prevailed in Europe after the Battle of Marignano was beginning to crumble. The major powers (France, England, Spain, and the Holy Roman Empire) were outwardly friendly, pledging by the Treaty of London to come to the aid of any of the signatories that was attacked and to combine against any nation that broke the peace. They were divided, however, on the question of the Imperial succession. The Holy Roman Emperor, Maximilian I, intending for a Habsburg to succeed him, began to campaign on behalf of Charles of Spain, while Francis put himself forward as an alternate candidate. At the same time, the Papacy and the Holy Roman Empire were forced to deal with the rising influence of Martin Luther, who found support among some Imperial nobles, while Francis was faced with Cardinal Thomas Wolsey, who interposed himself into the quarrels of the continent in an attempt to increase both England's influence and his own. Maximilian's death in 1519 brought the Imperial election to the forefront of European politics. Pope Leo X, threatened by the presence of Spanish troops a mere forty miles from the Vatican, supported the French candidacy. The prince-electors themselves, with the exception of Frederick of Saxony, who refused to countenance the campaigning, promised their support to both candidates at once. Before his death, Maximilian had already promised sums of 500,000 florins to the Electors in exchange for their votes, but Francis offered up to three million, and Charles retaliated by borrowing vast sums from the Fuggers. The final outcome, however, was not determined by the exorbitant bribes, which included Leo promising to make the Archbishop of Mainz his permanent legate. The general outrage of the populace at the idea of a French Emperor gave the Electors pause, and when Charles put an army in the field near Frankfurt, where they were meeting, the Electors obligingly voted for him. He was crowned Holy Roman Emperor on 23 October 1520, by which point he already controlled both the Spanish crown and the hereditary Burgundian lands in the Low Countries. Cardinal Wolsey, hoping to increase Henry VIII's influence on the continent, offered the services of England as a mediator for the various disputes between Francis and Charles. Henry and Francis staged an extravagant meeting at the Field of the Cloth of Gold. Immediately afterwards, Wolsey entertained Charles in Calais. Following the meetings, Wolsey, concerned mainly with improving his own stature in preparation for the next papal conclave, proceeded to stage a hollow arbitration conference at Calais, which lasted until April 1522 to no practical effect. In December, the French began to plan for war. Francis did not wish to openly attack Charles because Henry had announced his intention to intervene against the first party to break the tenuous peace. Instead, he turned to more covert support for incursions into German and Spanish territory. One attack would be made on the Meuse River, under the leadership of Robert de la Marck. Simultaneously, a French-Navarrese army would advance through Navarre after reconquering St-Jean-Pied-de-Port. The expedition was nominally led by the 18-year-old Navarrese king Henry d'Albret, whose kingdom had been invaded by Ferdinand II of Aragon in 1512, but the army was effectively commanded by André de Foix and funded and equipped by the French. The French designs quickly proved flawed as the intervention of Henry of Nassau drove back the Meuse offensive; and although de Foix was initially successful in seizing Pamplona, he was driven from Navarre after being defeated at the Battle of Esquiroz on 30 June 1521. Charles was meanwhile preoccupied with the issue of Martin Luther, whom he confronted at the Diet of Worms in March 1521. The Emperor viewed Catholicism as a natural way of binding the diverse principalities of the Holy Roman Empire to him. Since Pope Leo X, for his part, was unwilling to tolerate such open defiance of his own authority, he and the Emperor were forced to support one another against Luther, who was now backed by Frederick of Saxony and Franz von Sickingen. On 25 May 1521, Charles and Cardinal Girolamo Aleandro, the Papal nuncio, proclaimed the Edict of Worms against Luther. Simultaneously, the Emperor promised the Pope the restoration of Parma and Piacenza to the Medici and of Milan to the Sforza. Leo, needing the Imperial mandate for his campaign against what he viewed as a dangerous heresy, promised to assist in expelling the French from Lombardy, leaving Francis with only the Republic of Venice for an ally. In June, Imperial armies under Henry of Nassau invaded the north of France, razing the cities of Ardres and Mouzon and besieging Tournai. They were delayed by the dogged resistance of the French, led by Pierre Terrail, Seigneur de Bayard and Anne de Montmorency, during the Siege of Mezieres, which gave Francis time to gather an army to confront the attack. On 22 October 1521, Francis encountered the main Imperial army, which was commanded by Charles V himself, near Valenciennes. Despite the urging of Charles de Bourbon, Francis hesitated to attack, which allowed Charles time to retreat. When the French were finally ready to advance, the start of heavy rains prevented an effective pursuit and the Imperial forces were able to escape without a battle. Shortly afterwards, French-Navarrese troops under Bonnivet and Claude of Lorraine seized the key city of Fuenterrabia, at the mouth of the Bidasoa River on the Franco-Spanish border, following a protracted series of maneuvers, providing the French with an advantageous foothold in northern Spain that would remain in their hands for the next two years. Battles in Lombardy (1521–25). The engagements at Bicocca, the Sesia, and Pavia are labeled. By November, the French situation had deteriorated considerably. Charles, Henry VIII, and the Pope signed an alliance against Francis on 28 November. Odet de Foix, Vicomte de Lautrec, the French governor of Milan, was tasked with resisting the Imperial and Papal forces; he was outmatched by Prospero Colonna, however, and by late November had been forced out of Milan and had retreated to a ring of towns around the Adda River. There, Lautrec was reinforced by the arrival of fresh Swiss mercenaries; but, having no money available to pay them, he gave in to their demands to engage the Imperial forces immediately. On 27 April 1522, he attacked Colonna's combined Imperial and Papal army near Milan at the Battle of Bicocca. Lautrec had planned to use his superiority in artillery to his advantage, but the Swiss, impatient to engage the enemy, masked his guns and charged against the entrenched Spanish arquebusiers. In the resulting melee, the Swiss were badly mauled by the Spanish under Fernando d'Avalos, Marquess of Pescara, and by a force of landsknechts commanded by Georg Frundsberg. Their morale broken, the Swiss returned to their cantons; Lautrec, left with too few troops to continue the campaign, abandoned Lombardy entirely. Colonna and d'Avalos, left unopposed, proceeded to besiege Genoa, capturing the city on 30 May. Lautrec's defeat brought England openly into the conflict. In late May 1522, the English ambassador presented Francis with an ultimatum enumerating accusations against France, notably that of supporting the Duke of Albany in Scotland, all of which were denied by the king. Henry VIII and Charles signed the Treaty of Windsor on 16 June 1522. The treaty outlined a joint English-Imperial attack against France, with each party providing at least 40,000 men. Charles agreed to compensate England for the pensions that would be lost because of conflict with France and to pay the past debts that would be forfeit; to seal the alliance, he also agreed to marry Henry's only daughter, Mary. In July, the English attacked Brittany and Picardy from Calais. Francis was unable to raise funds to sustain significant resistance, and the English army burned and looted the countryside. Francis tried a variety of methods to raise money, but concentrated on a lawsuit against Charles III, Duke of Bourbon. The Duke of Bourbon had received the majority of his holdings through his marriage to Suzanne, Duchess of Bourbon, who had died shortly before the start of the war. Louise of Savoy, Suzanne's sister and the king's mother, insisted that the territories in question should pass to her because of her closer kinship to the deceased. Francis was confident that seizing the disputed lands would improve his own financial position sufficiently to continue the war and began to confiscate portions of them in Louise's name. Bourbon, angered by this treatment and increasingly isolated at court, began to make overtures to Charles V to betray the French king. By 1523, the French situation had entirely collapsed. The death of Doge Antonio Grimani brought Andrea Gritti, a veteran of the War of the League of Cambrai, to power in Venice. He quickly began negotiations with the Emperor and on 29 July concluded the Treaty of Worms, which removed the Republic from the war. Bourbon continued his scheming with Charles, offering to begin a rebellion against Francis in exchange for money and German troops. When Francis, who was aware of the plot, summoned him to Lyon in October, he feigned illness and fled to the Imperial city of Besançon. Enraged, Francis ordered the execution of as many of Bourbon's associates as he could capture, but the Duke himself, having rejected a final offer of reconciliation, openly entered the Emperor's service. Charles then invaded southern France over the Pyrenees. Lautrec successfully defended Bayonne against the Spanish, but Charles was able to recapture Fuenterrabia in February 1524. On 18 September 1523, meanwhile, a massive English army under the Duke of Suffolk advanced into French territory from Calais in conjunction with a Flemish-Imperial force. The French, stretched thin by the Imperial attack, were unable to resist, and Suffolk soon advanced past the Somme, devastating the countryside in his wake and stopping only fifty miles from Paris. When Charles failed to support the English offensive, however, Suffolk—unwilling to risk an attack on the French capital—turned away from Paris on 30 October, returning to Calais by mid-December. Guillaume Gouffier, Seigneur de Bonnivet, pencil and chalk drawing by Jean Clouet (c. 1516). Bonnivet commanded a number of French armies during the war. Francis now turned his attention to Lombardy. In October 1523, a French army of 18,000 under Bonnivet advanced through the Piedmont to Novara, where it was joined by a similarly sized force of Swiss mercenaries. Prospero Colonna, who had only 9,000 men to oppose the French advance, retreated to Milan. Bonnivet, however, overestimated the size of the Imperial army and moved into winter quarters rather than attacking the city; and the Imperial commanders were able to summon 15,000 landsknechts and a large force under Bourbon's command by 28 December, when Charles de Lannoy replaced the dying Colonna. Many of the Swiss now abandoned the French army, and Bonnivet began his withdrawal. The French defeat at the Battle of the Sesia, where Bayard was killed while commanding the French rearguard, again demonstrated the power of massed arquebusiers against more traditional troops; the French army then retreated over the Alps in disarray. D'Avalos and Bourbon crossed the Alps with nearly 11,000 men and invaded Provence in early July 1524. Sweeping through most of the smaller towns unopposed, Bourbon entered the provincial capital of Aix-en-Provence on 9 August 1524, taking the title of Count of Provence and pledging his allegiance to Henry VIII in return for the latter's support against Francis. By mid-August, Bourbon and d'Avalos had besieged Marseille, the only stronghold in Provence that remained in French hands. Their assaults on the city failed, however, and when the French army commanded by Francis himself arrived at Avignon at the end of September 1524, they were forced to retreat back to Italy. In mid-October 1524, Francis himself crossed the Alps and advanced on Milan at the head of an army numbering more than 40,000. Bourbon and d'Avalos, their troops not yet recovered from the campaign in Provence, were in no position to offer serious resistance. The French army moved in several columns, brushing aside Imperial attempts to hold its advance, but failed to bring the main body of Imperial troops to battle. Nevertheless, Charles de Lannoy, who had concentrated some 16,000 men to resist the 33,000 French troops closing on Milan, decided that the city could not be defended and withdrew to Lodi on 26 October. Having entered Milan and installed Louis II de la Trémoille as the governor, Francis (at the urging of Bonnivet and against the advice of his other senior commanders, who favored a more vigorous pursuit of the retreating Lannoy) advanced on Pavia, where Antonio de Leyva remained with a sizable Imperial garrison. The main mass of French troops arrived at Pavia in the last days of October 1524. By 2 November, Montmorency had crossed the Ticino River and invested the city from the south, completing its encirclement. Inside were about 9,000 men, mainly mercenaries whom Antonio de Leyva was able to pay only by melting the church plate. A period of skirmishing and artillery bombardments followed, and several breaches had been made in the walls by mid-November. On 21 November, Francis attempted an assault on the city through two of the breaches, but was beaten back with heavy casualties; hampered by rainy weather and a lack of gunpowder, the French decided to wait for the defenders to starve. In early December, a Spanish force commanded by Hugo of Moncada landed near Genoa, intending to interfere in a conflict between pro-Valois and pro-Habsburg factions in the city. Francis dispatched a larger force under Michele Antonio I of Saluzzo to intercept them. Confronted by the more numerous French and left without naval support by the arrival of a pro-Valois fleet commanded by Andrea Doria, the Spanish troops surrendered. Francis then signed a secret agreement with Pope Clement VII, who pledged not to assist Charles in exchange for Francis's assistance with the conquest of Naples. Against the advice of his senior commanders, Francis detached a portion of his forces under the Duke of Albany and sent them south to aid the Pope. Lannoy attempted to intercept the expedition near Fiorenzuola, but suffered heavy casualties and was forced to return to Lodi by the intervention of the infamous Black Bands of Giovanni de' Medici, which had just entered French service. Medici then returned to Pavia with a supply train of gunpowder and shot gathered by the Duke of Ferrara; but the French position was simultaneously weakened by the departure of nearly 5,000 Grisons Swiss mercenaries, who returned to their cantons in order to defend them against marauding landsknechts. In January 1525, Lannoy was reinforced by the arrival of Georg Frundsberg with 15,000 fresh landsknechts and renewed the offensive. D'Avalos captured the French outpost at San Angelo, cutting the lines of communication between Pavia and Milan, while a separate column of landsknechts advanced on Belgiojoso and, despite being briefly pushed back by a raid led by Medici and Bonnivet, occupied the town. By 2 February, Lannoy was only a few miles from Pavia. Francis had encamped the majority of his forces in the great walled park of Mirabello outside the city walls, placing them between Leyva's garrison and the approaching relief army. Skirmishing and sallies by the garrison continued through the month of February. Medici was seriously wounded and withdrew to Piacenza to recuperate, forcing Francis to recall much of the Milan garrison to offset the departure of the Black Band; but the fighting had little overall effect. On 21 February, the Imperial commanders, running low on supplies and mistakenly believing that the French forces were more numerous than their own, decided to launch an attack on Mirabello Castle in order to save face and demoralize the French sufficiently to ensure a safe withdrawal. In the early morning of 24 February 1525, Imperial engineers opened breaches in the walls of Mirabello, allowing Lannoy's forces to enter the park. At the same time, Leyva sortied from Pavia with what remained of the garrison. In the ensuing four-hour battle, the French heavy cavalry, which had proven so effective against the Swiss at Marignano ten years prior, masked its own artillery by a rapid advance and was surrounded and cut apart by landsknechts and d'Avalos's massed Spanish arquebusiers. Meanwhile, a series of protracted infantry engagements resulted in the rout of the Swiss and French infantry. The French suffered massive casualties, losing the majority of their army. Bonnivet, Jacques de la Palice, La Trémoille, and Richard de la Pole were killed, while Anne de Montmorency, Robert de la Marck, and Francis himself were taken prisoner along with a host of lesser nobles. The night following the battle, Francis gave Lannoy a letter to be delivered to his mother in Paris, in which he related what had befallen him: "To inform you of how the rest of my ill-fortune is proceeding, all is lost to me save honour and life, which is safe." Soon afterwards, he finally learned that the Duke of Albany had lost the larger part of his army to attrition and desertion, and had returned to France without ever having reached Naples. The broken remnants of the French forces, aside from a small garrison left to hold the Castel Sforzesco in Milan, retreated across the Alps under the nominal command of Charles IV of Alençon, reaching Lyon by March 1525. After Pavia, the fate of the French king, and of France herself, became the subject of furious diplomatic manoeuvring. Charles V, lacking funds to pay for the war, decided to forgo the marriage into the House of Tudor which he had promised Henry VIII and sought instead to marry Isabella of Portugal, who would bring with her a more substantial dowry. Bourbon, meanwhile, plotted with Henry to invade and partition France, and at the same time encouraged d'Avalos to seize Naples and declare himself King of Italy. Louise of Savoy, who had remained as regent in France during her son's absence, attempted to gather troops and funds to defend against an expected invasion of Artois by English troops. She also sent a first French mission to Suleiman the Magnificent requesting assistance, but the mission was lost on its way in Bosnia. In December 1525 a second mission was sent, led by John Frangipani, which managed to reach Constantinople, the Ottoman capital, with secret letters asking for the deliverance of king Francis I and an attack on the Habsburg. Frangipani returned with an answer from Suleiman, on 6 February 1526, initiating the first steps of a Franco-Ottoman alliance. Suleiman eventually wrote an ultimatum to Charles, asking for the immediate release of Francis—and demanding a yearly tax from the Holy Roman Empire; when this was not forthcoming, the Ottomans launched an invasion of Hungary in the summer of 1526, aiming to reach Vienna. Francis, convinced that he would regain his freedom if he could obtain a personal audience with Charles, pressed d'Avalos and Lannoy, who had intended to transport the king to the Castel Nuovo in Naples, to send him to Spain instead. Concerned by Bourbon's scheming, they agreed and Francis arrived in Barcelona on 12 June. Francis was initially held in a villa in Benisanó, near Valencia, but Charles, urged to negotiate a settlement by Montmorency and Lannoy, who suggested that the Italians would soon prove unfaithful to their Imperial alliance, ordered the king brought to Madrid and imprisoned in the citadel there. However, Charles adamantly refused to receive Francis personally until the latter had accepted an agreement. Meanwhile, Henry II of Navarre, who had fought alongside Francis at Pavia and who had been imprisoned in Madrid as well, escaped. The struggle for Navarre continued, with Charles occupying the southern fringes of Lower Navarre and Henry remaining at large. Charles demanded not only the surrender of Lombardy, but also of Burgundy and Provence, forcing Francis to argue that French law prevented him from surrendering any lands possessed by the crown without the approval of Parlement, which would not be forthcoming. In September, Francis fell gravely ill, and his sister, Marguerite de Navarre, rode from Paris to join him in Spain. The Imperial doctors examining the king believed that his illness was caused by his sorrow at not being received by the Emperor, and urged Charles to visit him. Against the advice of his Grand Chancellor, Mercurino Gattinara (who argued that seeing Francis on his deathbed was an action motivated by mercenary concerns rather than by compassion, and was thus unworthy of the Emperor) Charles consented; and Francis soon made a complete recovery. An attempt to escape, however, proved fruitless, and succeeded only in getting Marguerite sent back to France. The final frontiers of France after the Peace of Cateau-Cambrésis in 1559. Despite more than three decades of further warfare, the French failed to regain any of their former possessions in Lombardy. 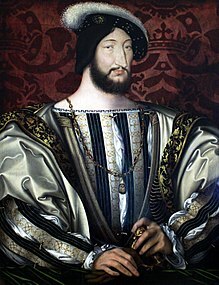 By the beginning of 1526, Charles was faced with demands from Venice and the Pope to restore Francesco II Sforza to the throne of the Duchy of Milan, and had become anxious to achieve a settlement with the French before another war began. Francis, having argued to retain Burgundy without result, was prepared to surrender it to achieve his own release. On 14 January 1526, Charles and Francis agreed to the Treaty of Madrid, by which the French king renounced all his claims in Italy, Flanders, and Artois, surrendered Burgundy to Charles, agreed to send two of his sons to be hostages at the Spanish court, and promised to marry Charles' sister Eleanor and to restore to Bourbon the territories that had been seized from him. Francis, who held the title of "Most Christian King", also agreed to persuade Henry to relinquish the throne of Navarre in favor of Charles "in order to uproot the errors of the Lutheran sect and the rest of condemned sects". Francis was released on 6 March and, escorted by Lannoy, journeyed north to Fuenterrabia. On 18 March, he crossed the Bidasoa north into France, while at the same time the Dauphin and his brother, who had been brought to Bayonne by Louise and Lautrec, crossed into Spain and into captivity. By this time, Francis had attained peace with England by the Treaty of Hampton Court; drafted by Thomas Wolsey and the French ambassador at the Hampton Court Palace, the treaty was signed in 1526, and was ratified by a French delegation in April 1527 at Greenwich. Francis, however, had no intentions of complying with the remaining provisions of the Treaty of Madrid. On 22 March, with the Pope's blessing, he proclaimed that he would not be bound by the Treaty of Madrid because it had been signed under duress. Clement VII, who had meanwhile become convinced that the Emperor's growing power was a threat to his own position in Italy, sent envoys to Francis and Henry VIII suggesting an alliance against Charles. Henry, having received nothing from the Treaty of Madrid, was receptive to the offers. In May, Francis and the Pope launched the War of the League of Cognac in an attempt to reclaim the territory the French had lost; Henry, rebuffed in his attempt to have the alliance signed in England, would not join until 1527. The war would prove unsuccessful; but Francis and his successor, Henry II, would continue to assert their claims to Milan through the remainder of the Italian Wars, only relinquishing them after the Peace of Cateau-Cambrésis in 1559. ^ The name refers to the four years between the beginning of hostilities in 1521 and the Battle of Pavia in 1525, although the war did not formally end until 1526. ^ Mallett and Shaw, The Italian Wars, 140. ^ Mallett and Shaw, The Italian Wars, 142–43. ^ Guicciardini, History of Italy, 316–318. ^ Monreal and Jimeno, Conquista, 67. ^ a b Blockmans, Emperor Charles V, 51–52. ^ Oman, Art of War, 173–174. ^ Konstam, Pavia 1525, 88. ^ Oman, Art of War, 176–178. ^ Blockmans, Emperor Charles V, 57; Taylor, Art of War in Italy, 125–126. ^ Blockmans, Emperor Charles V, 57. ^ Konstam, Pavia 1525, 25–26. ^ Guicciardini, History of Italy, 335; Norwich, History of Venice, 439. ^ Blockmans, Emperor Charles V, 45. ^ Gunn, "Suffolk's March", 631–633. ^ Konstam, Pavia 1525, 27. ^ Konstam, Pavia 1525, 27–28. ^ Konstam, Pavia 1525, 28; Taylor, Art of War in Italy, 53–54. ^ Konstam, Pavia 1525, 28. ^ Konstam, Pavia 1525, 28–29. ^ Blockmans, Emperor Charles V, 57; Guicciardini, History of Italy, 343–344;Konstam, Pavia 1525, 29. ^ Konstam, Pavia 1525, 89. ^ Konstam, Pavia 1525, 30—33. ^ Konstam, Pavia 1525, 34. ^ Konstam, Pavia 1525, 34–35. ^ Konstam, Pavia 1525, 36–39. ^ Konstam, Pavia 1525, 40–41. ^ Blockmans, Emperor Charles V, 57; Konstam, Pavia 1525, 42–43. ^ Konstam, Pavia 1525, 43–45. ^ Blockmans, Emperor Charles V, 59; Konstam, Pavia 1525, 46–50. ^ Konstam, Pavia 1525, 50. ^ Konstam, Pavia 1525, 52–53. ^ Konstam, Pavia 1525, 56–74; Taylor, Art of War in Italy, 126–127. ^ a b Konstam, Pavia 1525, 76. ^ Guicciardini, History of Italy, 348. ^ Guicciardini, History of Italy, 357–358. ^ a b Merriman, Suleiman the Magnificent, 129. ^ Guicciardini, History of Italy, 358;Guicciardini notes that he did not "know whether [Francis believed this] because he measured men by his own nature; or because men easily delude themselves when their own desires are involved." ^ Knecht, Renaissance Warrior, 242. ^ Guicciardini, History of Italy, 359. ^ Urzainqui et al., Conquista de Navarra, 21. ^ Guicciardini, History of Italy, 357. The Imperial demands were first delivered to Francis by Büren, the Emperor's chamberlain, when he was still imprisoned in the fortress of Pizzichitone after the Battle of Pavia; Charles had originally intended that Bourbon would be given an independent Provence as a reward for his services. ^ Guicciardini, History of Italy, 360. ^ Guicciardini, History of Italy, 363. ^ Blockmans, Emperor Charles V, 60, 68; Guicciardini, History of Italy, 363–364; Oman, Art of War, 211. ^ Urzainqui et al., Conquista de Navarra, 21. The agreement also reiterated the need to destroy "the Infidels". ^ Guicciardini, History of Italy, 366. ^ Guicciardini, History of Italy, 365–366. Guicciardini records that Clement feared that "the Emperor's greatness would inevitably mean his servitude." ^ Guicciardini, History of Italy, 369, 392. Gunn, S.J. "The Duke of Suffolk's March on Paris in 1523." The English Historical Review 101, no. 400 (July 1986): 596–634. Merriman, Roger Bigelow. Suleiman the Magnificent, 1520–1566. Lundberg Press, 2007. ISBN 1-4067-7272-0. Monreal, Gregorio and Roldan Jimeno. Conquista e Incorporación de Navarra a Castilla. Pamplona-Iruña: Pamiela, 2012. ISBN 978-84-7681-736-0. Urzainqui, Tomas, Pello Esarte, Alberto García Manzanal, Iñaki Sagredo, Eneko Del Castillo, Emilio Monjo, Francisco Ruiz de Pablos, Pello Guerra Viscarret, Halip Lartiga, Josu Lavin, and Manuel Ercilla. La Conquista de Navarra y la Reforma Europea. Pamplona-Iruña: Pamiela, 2013. ISBN 978-84-7681-803-9.